First impressions of the Faraday are, “That’s a very fun bike.” The pedelec config with the lightweight (for an ebike) means you can get a workout if you want or a sweat-free ride to work, and a meeting. It was back in 2012, when Faraday was Kickstarted, for 110K, and 3 years later they’re in bike shops, like G and O Family Cyclery in Seattle. Had fun with this @faradaybikes today. While I’m having more fun and writing a review, see what Kent had to say about his Faraday ride. He also had thought it was fun. Let’s talk a bit about the electronics. The Faraday Porteur comes with a 250W motor built into the front hub and a custom 240Wh battery pack concealed inside the frame. I’d wondered about the replace-ability and durability of the batteries but the folks at Faraday assure me that the high quality lithium batteries should last through several years of charging cycles and when they ultimately do need replacing, it’s an easy job for a local shop. They estimate current battery replacement cost at $400, but battery tech is getting better year by year and the prices are dropping. 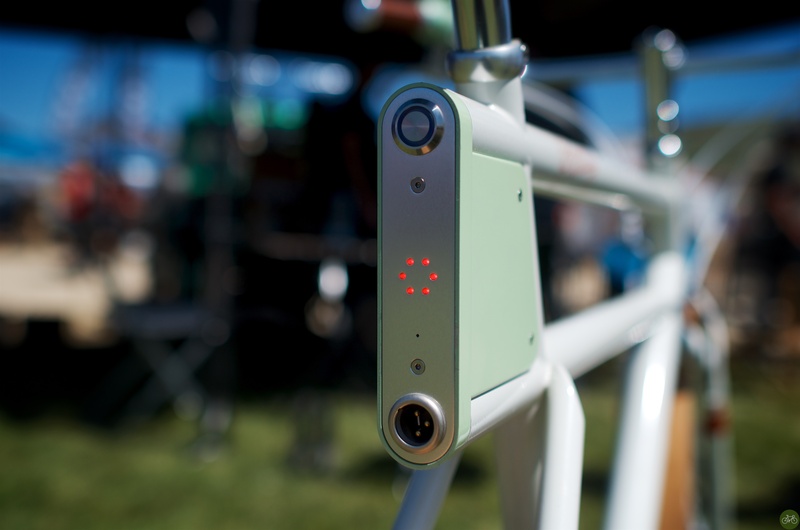 The batteries power both the bike’s lights and it’s motor. When the bike is switched on, the lights are on. The integrated lights are nice, bright LEDs.